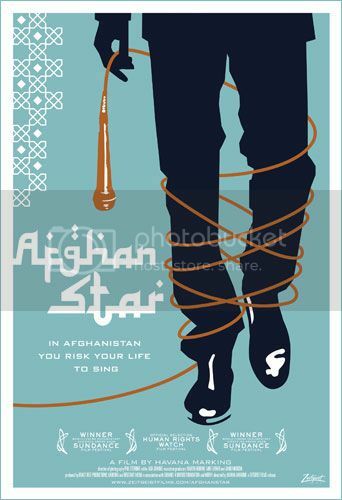 In Afghanistan, you risk your life to sing. Celebrities worldwide will be familiar and agree with this statement. But for those in Afghanistan, the term security problems take on an entirely different meaning. Their security problems include daily death threats and assassination plots. The Taliban, which has been controlling Afghanistan from 1996-2001 and was eventually removed from power by the NATO forces of the United States’ Operation Enduring Freedom, has regrouped since 2004 and is presently fighting a guerilla war with Pakistan and others. In 1996, the Taliban enforced a strict ban on dancing, listening to music and watching television. Though the ban was lifted eight years later, music is still regarded as sinful and abstained from in Afghan culture. In the midst of this religious culture, Afghan Star is launched. Afghan Star is basically a pop idol type competition where selected contestants sing to earn the Afghan Star title. The competition has faced political ridicule and uproar, since it was launched in September 2005. The third season was particularly controversial, and it is this third season that filmmaker, Havana Marking and her production team have documented. The result: an 87-minute documentary following the lives of four contestants and Afghan Star’s impact on the community and country. The film also showcases Afghanistan’s culture, history, religious and political restrictions, and the Taliban effect. It is amazing to watch the evolution of a simple competition becoming the heart of both unity and discontent in Afghanistan. The four contestants that Marking’s documentary shadows are from different ethnicities within Afghanistan. They face trials that may seem so unrealistic to us, but for them, it is part of the pathway to becoming famous. Rafi, a nineteen year old; Hameed, a classically trained singer; Lema, a poor Pashtun woman; and, Setara, a twenty one year old with big dreams of fame and freedom. The general ‘women are second class citizens’ notion is dispelled by the competition as it offers a fair and equal platform for both men and women. However, compared to the guys, the girls seem to face more difficulties. Setara causes a huge scandal when she danced on stage and let her headscarf slip. She was ridiculed in her community and had to move out of her home for fear of death. The documentary shows the public’s reaction to her misfortune and surprisingly even her own people condemn her to death! Lema has also been facing death threats. The Taliban turned against her when she suggested that they might vote for her since she is of Pashtun descent as well. Afghan Star portrays the contrast of those who opt for the rigid rules installed by the Taliban against modernism and those who wish to move on to a new forward-looking Afghanistan. It also artfully captures the anxiety and excitement of the contestants, organizers and the general public. As the audience, you can definitely feel the buzz of exhilaration in Afghanistan as the finals draw closer. Afghan Star has received a well deserved 100% fresh aggregate rating at ratings.com. It has also recieved highly favorable reviews from the Boston Globe, Washington Post and New York Times, with Stephen Holden of the New York Times saying, “The movie uses the talent show “Afghan Star” as a prism through which to examine the fragmented tribal culture of Afghanistan as reflected in the backgrounds of four finalists (two of them women) and the public responses to their performances.” Very true. Afghan Star was given The World Cinema Audience Award and The World Cinema Directing Award from the 2009 Sundance Film Festival, January this year. All in all, the documentary portrays the emotions of a country that has been riddled with war for the past 30 years. The Singapore Film Society and Young Changemakers will be screening this must-watch on this coming November 22 at the National Museum of Singapore. Tickets go on sale for S$10 per pop. For more details, visit, http://www.sfs.org.sg/event.php?id=245. Wait! Who won? Not telling! Watch and find out! Visit the Afghan Star official website here. Here’s the trailer for Afghan Star.